February 2010 sees the Centenary of Manchester United’s first game at Old Trafford. To celebrate this auspicious occasion Iain McCartney has updated his original 1996 book with new pictures of the last 100 years at the famous ground, still widely regarded as the finest club stadium in British football. Over the past 100 years Old Trafford has hosted World Cup and European Championship matches, FA Cup Finals and a Champions League Final and has witnessed countless United wins, draws and defeats. Yet it endures, above all, as a monument to the vision of the club's founder and first patron John Henry Davies. Recognising football's exponential growth in the 1900s and the need to safely house vast numbers of supporters, Davies recognised that the champions of England and 1909 FA Cup winners needed a more spacious home than tatty old Bank Street, in Clayton, a ground with few facilities and a capacity of less than 25,000. Built in 1909 and officially opened in February 1910 for the league visit of Liverpool, Old Trafford was instantly acclaimed by one reporter as "the most handsomest [sic], the most spacious and the most remarkable arena I have ever seen. As a football ground it is unrivalled in the world, it is an honour to Manchester and the home of a team who can do wonders when they are so disposed.” Unfortunately the stadium arrived at just the wrong time for the club as United were about to begin a 37 year trophy-free run, the longest in the club's history. Consequently, United's average attendance before the war rarely topped the 30,000 mark, in a ground with a capacity of over 70,000. The luckless stadium suffered a further blows on the nights of the 8th and 11th March 1941 when it was bombed during The Blitz. And so for four seasons after the war United were forced to play their 'home' fixtures at Maine Road. The arrival of floodlights and European football heralded a new chapter: the stadium is widely regarded as at its best on such occasions and from the first game against the immortals of Real Madrid in 1957 the ground hosted continental opposition and became renowned across Europe. In the sixties the ground had a new cantilever stand added to the west in preparation for the 1966 World Cup Finals and, later, more seats were added at the Scoreboard End and behind the Stretford End. However these improvements were as nothing compared to the dramatic changes brought about in the wake of the Taylor Report. The birth of the Premier League and United's domestic dominance helped transform the ground - first into an all-seater stadium, then steady season-by-season growth saw it swell to hold over 75,000. For a period during the protracted construction of Wembley, the ground even became the national stadium hosting 12 England matches. Calling on the vast photographic resources of avid Manchester United collectors and enthusiasts, what emerges is a fascinating history of the first super stadium of English football. 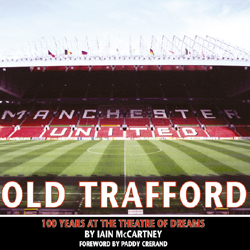 It also traces the history of United via its home ground, from the post WWI football boom and the record crowds of the 1920s and 30s, to the bomb damage sustained during the Manchester Blitz and the 8 year wait for the stadium to be fully re-built and the beginning, in the mid 1960s, of terrace hooliganism and the club’s attempts to deal with it. Now the stadium, a vast arena holding over 75,000 seats, is valued at over £300m. Not bad for a patch of land once given over to cattle grazing.